The Department of Defense is an executive branch department of the federal government of the United States charged with coordinating and supervising all agencies and functions of the government concerned directly with national security and the United States Armed Forces. The Department is also the largest employer in the world, with more than 2.13 million active duty servicemen and women as well as their support staff of civilian workers. Adding to the total is over 1.1 million National Guardsmen and Reservists from the four services, bringing the total to just over 3.2 million employees. The Department of Defense is headed by the Secretary of Defense, a cabinet-level head who reports directly to the President of the United States. Beneath the Department of Defense are three subordinate military departments: the U.S. Department of the Army, the U.S. Department of the Navy, and the U.S. Department of the Air Force. 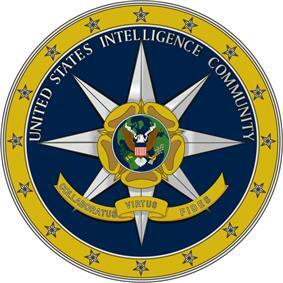 In addition, four national intelligence services are subordinate to the Department of Defense: the Defense Intelligence Agency (DIA), the National Security Agency (NSA), the National Geospatial-Intelligence Agency (NGA), and the National Reconnaissance Office (NRO). 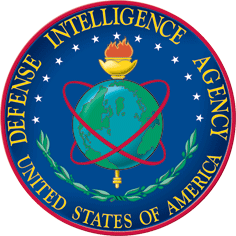 Other Defense Agencies including the Defense Advanced Research Projects Agency (DARPA), the Defense Logistics Agency (DLA), the Missile Defense Agency (MDA), Defense Threat Reduction Agency (DTRA), and the Pentagon Force Protection Agency (PFPA), all of which are under the command of the Secretary of Defense. Military operations are managed by nine regional or functional Unified Combatant Commands. The Department of Defense also operates several joint services schools, including the National Defense University (NDU) and the National War College (NWC). The history of the defense of the United States started with the Continental Congress in 1775. The creation of the United States Army was enacted on June 14, 1775. This coincides with the American holiday Flag Day. The Continental Congress would charter the United States Navy, on October 13, 1775. The United States Marine Corps, while today a subordinate department to the Navy, was enacted by the Continental Congress separately on November 10, 1775. The first Congress was seated on March 4, 1789. This first Congress had a huge agenda, that of creating legislation to build a government for the ages. Legislation to create a military defense force went stagnate. Two separate times, President War Department. Following the aftermath of World War II, President Harry Truman proposed creation of a unified department of national defense. In a special message to Congress on December 19, 1945, the President cited both wasteful military spending and inter-departmental conflicts. Deliberations in Congress went on for months focusing heavily on the role of the military in society and the threat of granting too much military power to the executive. 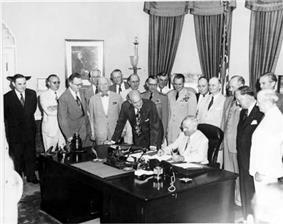 On July 26, 1947, Truman signed the National Security Act of 1947, which set up a unified military command known as the "National Military Establishment", as well as creating the Central Intelligence Agency, the National Security Council, National Security Resources Board, United States Air Force (formerly the Army Air Forces) and the Joint Chiefs of Staff. The act placed the National Military Establishment under the control of a single Secretary of Defense. The National Military Establishment formally began operations on September 18, the day after the Senate confirmed James V. Forrestal as the first Secretary of Defense. The National Military Establishment was renamed the "Department of Defense" on August 10, 1949, in an amendment to the original 1947 law. Under the Advanced Research Projects Agency, eventually known as DARPA. The Act moved decision-making authority from the Military Departments to the Joint Chiefs of Staff and the Secretary of Defense. It also strengthened the command channel of the military over U.S. forces from the President to the Secretary of Defense. Written and promoted by the Eisenhower administration, it was signed into law August 6, 1958. The military services each have their own intelligence elements which are distinct from but subject to coordination by the national intelligence agencies under the Department of Defense. Department of Defense manages the nation's coordinating authorities and assets in the disciplines of signals intelligence, geospatial intelligence, and measurement and signature intelligence and also builds, launches, and operates the Intelligence Community's satellite assets. Department of Defense also has its own human intelligence service which contributes to the CIA's human intelligence efforts while also focusing on military human intelligence priorities. These agencies are directly overseen by the Undersecretary of Defense for Intelligence. The Joint Chiefs of Staff (JCS) is a body of senior uniformed leaders in the Department of Defense who advise the Secretary of Defense, the Homeland Security Council, the National Security Council and the President on military matters. The composition of the Joint Chiefs of Staff is defined by statute and consists of the Chairman of the Joint Chiefs of Staff (CJCS), Vice Chairman of the Joint Chiefs of Staff (VCJCS), Senior Enlisted Advisor to the Chairman (SEAC), and the Military Service Chiefs from the Army, Navy, Air Force, Marine Corps and the National Guard, all appointed by the President following Senate confirmation. Each of the individual Military Service Chiefs, outside of their Joint Chiefs of Staff obligations, works directly for the Secretary of the Military Department concerned, i.e. Secretary of the Army, Secretary of the Navy, and the Secretary of the Air Force. 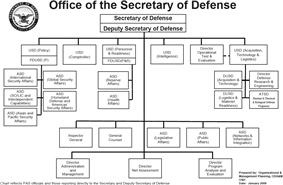 Following the Goldwater-Nichols Act in 1986 the Joint Chiefs of Staff do not have operational command authority, neither individually nor collectively, as the chain of command goes from the President to the Secretary of Defense, and from the Secretary of Defense to the Commanders of the Combatant Commands. Goldwater-Nichols also created the office of Vice Chairman, and the Chairman is now designated as the principal military adviser to the Secretary of Defense, the Homeland Security Council, the National Security Council and to the President. The Joint Staff (JS) is a headquarters staff in the Pentagon, composed of personnel from all the four services, that assists the Chairman and the Vice Chairman in discharging their responsibilities and is managed by the Director of the Joint Staff (DJS) who is a Lieutenant General or Vice Admiral. 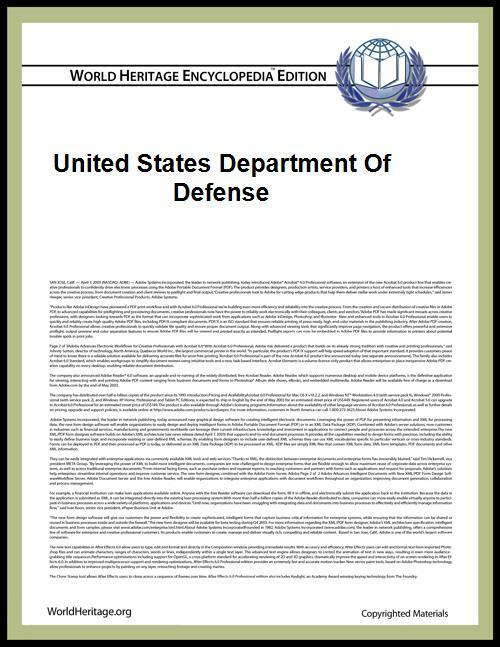 ^ "Department of Defense" (PDF). Retrieved 2010-10-15. ^ "Budget of the US Government, FY 2011" (PDF). Retrieved 2010-10-15. ^ Maass, John R. (June 14, 2012). "June 14th: The Birthday of the U.S. Army". U.S. Army Center of Military History. Retrieved June 19, 2014. ^ Naval History and Heritage Command. "Navy Birthday Information - 13 October 1775". Retrieved June 19, 2014. ^ "Marine Corps: Timeline". United States Marine Corps. Retrieved June 19, 2014. ^ "Congress Officially Created the U.S. Military: September 29, 1789". Library of Congress. Retrieved June 20, 2014. ^ Hogan, Michael J. (2000). A cross of iron: Harry S. Truman and the origins of the national security state, 1945-1954. Cambridge University Press. pp. 37–38. ^ Polmar, Norman (2005). The Naval Institute guide to the ships and aircraft of the U.S. fleet. Naval Institute Press. p. 17. ^ a b Hugh W. Nibley (1944-07-04). "Warfare and the Book of Mormon". Maxwellinstitute.byu.edu. Retrieved 2010-10-15. ^ Bolton, M. Kent (2008). U.S. national security and foreign policymaking after 9/11: present at the re-creation. Rowman & Littlefield. p. 3. ^ Rearden, Steven L. (2001). "Department of Defense". In DeConde, Alexander et al. Encyclopedia of American Foreign Policy, Volume 1. Simon and Schuster. ^ "Organizational and Management Planning". Odam.defense.gov. Retrieved 2013-06-15. ^ Polmar, Norman (2005). "Defense organization". The Naval Institute guide to the ships and aircraft of the U.S. fleet. Naval Institute Press. ^ a b c d Polmar, Norman (2005). "Defense Organization". The Naval Institute guide to the ships and aircraft of the U.S. fleet. Naval Institute Press. p. 20. ^ Watson, Cynthia A. (2010). Combatant Commands: Origins, Structure, and Engagements. ABC-CLIO. p. 3. ^ a b c Whitley, Joe D. et al., ed. (2009). "Unified Combatant Commands and USNORTHCOM". Homeland security: legal and policy issues. American Bar Association. ^ Reveron, Derek S. (2007). America's Viceroys: The Military and U.S. Foreign Policy. Macmillan. p. 26. ^ "Military Spending: Defence Costs". The Economist. June 8, 2011. ^ "The SIPRI Military Expenditure Database". ^ "United States Federal Budget for Fiscal Year 2010". ^ p.53)"vid. "United States Federal Budget for Fiscal Year 2010 (. ^ a b p.25)"vid. "FY 2010 DoD Agencywide Agency Financial Report (. US Department of Defense. Retrieved 7 January 2011. ^ "Financial Improvement and Audit Readiness (FIAR) Plan Status Report". ^ Andrews Anthony (2011). 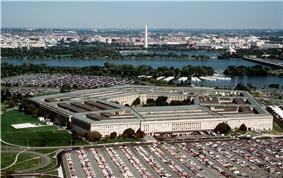 Department of Defense Facilities: Energy Conservation Policies and Spending. DIANE Publishing. p. 1. ^ Totals based upon Fiscal Year 2012 numbers. The Department of Defense is responsible for 93% of all US government fuel consumption in 2007 (Department of the Air Force: 52%; Department of the Navy: 33%; Department of the Army: 7%; other Department components: 1%). The Department of Defense uses 4,600,000,000 US gallons (1.7×1010 L) of fuel annually, an average of 12,600,000 US gallons (48,000,000 L) of fuel per day. A large Army division may use about 6,000 US gallons (23,000 L) per day. According to the 2005 CIA World Factbook, if it were a country, the Department of Defense would rank 34th in the world in average daily oil use, coming in just behind Iraq and just ahead of Sweden. The Air Force is the largest user of fuel energy in the federal government. The Air Force uses 10% of the nation's aviation fuel. (JP-8 accounts for nearly 90% of its fuels.) This fuel usage breaks down as such: 82% jet fuel, 16% facility management and 2% ground vehicle/equipment. The current allocation for the Department of Defense the highest level of budgetary resources among all Federal agencies, and this amounts to more than one-half of the annual Federal discretionary budget. 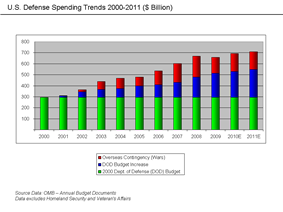 The Department of Defense accounts for the majority of federal discretionary spending. In FY 2010 the Department of Defense budgeted spending accounted for 21% of the U.S. Federal Budget, and 53% of federal discretionary spending, which represents funds not accounted for by pre-existing obligations. However, this does not include many military-related items that are outside of the Defense Department budget, such as nuclear weapons research, maintenance, cleanup, and production, which is in the Department of Energy budget, Veterans Affairs, the Treasury Department's payments in pensions to military retirees and widows and their families, interest on debt incurred in past wars, or State Department financing of foreign arms sales and militarily-related development assistance. Neither does it include defense spending that is not military in nature, such as the Department of Homeland Security, counter-terrorism spending by the FBI, and intelligence-gathering spending by NASA. Department of Defense spending in 2010 was 4.8% of GDP and accounted for approximately 45% of budgeted global military spending – more than the next 17 largest militaries combined. The Secretaries of the Military Departments, in turn, normally exercises authority over their forces by delegation through their respective Service Chiefs (i.e., Chief of Staff of the Army, Chief of Naval Operations, Commandant of the Marine Corps, and Chief of Staff of the Air Force) over forces not assigned to a Combatant Command.